New Science and Social Markets: Why do you need to write a blog? You would not believe what happened at the Innovate-Educate / NMSTE Conference 2010. In a room packed with k12 teachers, and to my absolute surprise, I made a statement that caused an intense emotional reaction. Before I tell you what I said, let me tell you, what is behind my statement. 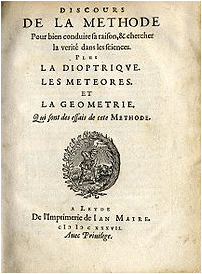 In 1617, Descartes published the book Discourse, which"...sketches out the metaphysical underpinnings of the Cartesian system". In it, he writes "I think, therefore I am", later refined to his well known "Cogito ergo sum." Setting aside the extraordinary importance of the expression, the reason this book is so important, is because Descartes uses it to explain what was his thought process to reach his amazing conclusions. In a world of interdependent people, where recessions become global events, it is no longer enough to say "you know it". Society needs to know, "how you got to know it". In the knowledge economy, what you know and how you think. are equally important. "I will never hire a person that doesn't write a blog." Do you know why the teachers got so emotional? Because they have the hardest of time, making their students write. P.S. - It was amazing to see the teacher's passion at the conference.